Prof. Ranjit Kaur started his career as Faculty of Electronics & Communication Engineering as Assistant Professor at Sant Longowal Institute of Engineering and Technology, Longowal and served there from Januarary 1998 to September 2006. In September 2006, she joined as a Reader in the Department of Electronics and Communication Engineering of Punjabi University, Patiala. 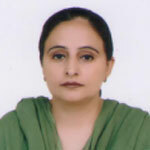 In March 2014 Prof. Ranjit Kaur promoted as Professor in the Department of Electronics and Communication Engineering at Punjabi University, Patiala. Presently Prof. Ranjit Kaur is serving as a Professor in the Department of Electronics and Communication Engineering at Punjabi University, Patiala. During her academic career span of 20 years, Prof. Kaur has taught various subjects at UG/PG levels and has published more than 75 research papers in International and National journals and Conferences. Prof. kaur has guided more than 26 M. Tech. Dissertations and presently guiding 8 Ph.D. scholars. Along with being a good teacher Prof. Kaur has handled number of administrative assignments successfully and made exemplary contributions through his dedicated, committed and innovative approach with high integrity. Prof. Kaur has active interaction with the outside world and has visited different countries for conferences, paper presentation etc. She is also member of various National and International academic societies including Institution of Electrical and Electronics Engineers (IEEE) and Indian Society of Technical Education (ISTE) etc.